Cheese is a solid or semisolid protein food product manufactured from milk and before the advent of modern methods of food preservation, like refrigeration, pasteurisation and canning; cheese manufacture was the only method of preserving milk. Although basic cheese making is a bacterial fermentation, there are two important processes to which fungi make a crucial contribution. These are the provision of enzymes for milk coagulation right at the start of the process, and mould-ripening to change the flavour and/or consistency of the product. the initial coagulum is cut into segments, heated (for example, by direct steam injection or through steam-jacketing of the vat) to about 60ºC, and stirred for about 15 min, which causes the fluid whey to start separating from the solid curds. Extraction or expulsion of a liquid from a gel like this is called syneresis. Enzymatic digestion of casein molecules enables calcium bonds to form and hydrophobic regions develop that force water molecules to leave the structure. The curd is cooked, or scalded, to expel the whey. cheese curds can then be made into the product the cheese maker requires (Fig. 40), which is where the lactobacterial fermentation comes into prominence, though other factors (like temperature, pH and additives) can be varied for particular recipes. Salt is added to the cheese to slow down bacterial activity and to enhance the taste of cheese. Salt also affects enzymatic activity in cheese during cheese ripening (Farkye, 2004). A preparation of animal enzymes (called rennet or chymosin) extracted from the stomach membranes of unweaned ruminants has traditionally been the primary coagulant of milk protein in the manufacture of cheese. Rapid expansion of the production and consumption of cheese caused attention to shift to alternative sources of such enzymes. Stomachs from older animals were unsuitable because their high content of pepsin resulted in a less effective coagulation and more proteolysis, causing lower cheese yields and development of off-flavours. Moulds like Aspergillus and Mucor were identified as potential sources and aspartyl proteinases from Rhizomucor pusillus, R. miehei and Cryphonectria parasitica were found to be more or less satisfactory for at least some cheeses, so fungal enzymes supplied the market to an extent. Eventually, the gene for calf chymosin (or prochymosin) was cloned, first in prokaryotic and then eukaryotic microorganisms and in recent years animal enzymes produced by genetically modified microbes have come to dominate the market. Fig. 40. The cheese spectrum. There is a wide range of cheeses on the market; they vary from extremely soft to extremely hard, a factor which is controlled by the extent of the proteolysis which is allowed, the cooking temperatures and the pH. They vary in flavour according to the microbes the milk originally contained and/or according to the microbes and other materials introduced into the cheese during fermentation or later processing. They also vary in flavour, of course, according to the origin of their substrate. Milk is not a uniform commodity; cow’s milk differs between breeds of cattle, and cheese is also made from ewe’s, goat’s, buffalo’s and camel’s milk (redrawn after Farkye, 2004). Indeed, chymosin, the milk-clotting enzyme used to make cheese and other dairy products, was the first enzyme from a genetically-modified source to gain approval for use in food manufacture. In March 1990, the US Food and Drug Administration (FDA) issued the first regulation in the US for the use in food of any substance produced by recombinant DNA technology by affirming that such chymosin was ‘generally recognised as safe’ (GRAS). The importance of this was that it exempted the product from the premarket approval requirements that apply to new food additives. At that time, the source of the new enzyme was a bovine pro-chymosin gene expressed in the bacterium Escherichia coli. Subsequently, chymosin preparations produced commercially from the yeast Kluyveromyces lactis and the filamentous Aspergillus awamori (both Ascomycota) genetically modified to include bovine pro-chymosin were also given GRAS status. The FDA concluded that fermentation-derived chymosin (FDC) was purer than traditional calf rennet and was identical to its natural counterpart. It was verified that the yield, texture, and quality of cheese made with FDC was comparable to that made with calf chymosin and that FDC gave superior yield to other coagulants. Microbial rennets have been improved in a number of ways including reducing their nonspecific proteolysis (which improves yield) and thermal stability (which makes it easier to control the elasticity of the product; keeping soft cheeses soft in other words). Today, about 90% of cheese production depends on enzymes from genetically modified microbes (mainly yeasts, but including A. awamori) for the coagulation step. Commercial microbial proteinases derived from Bacillus, Aspergillus spp. or from Rhizomucor niveus, and nonspecific aminopeptidases from A. oryzae are used for a range of other food modifications including casein and whey protein hydrolysates with reduced allergenicity and rich in bioactive peptides, debittering and flavour generation in protein hydrolysates, and enzyme-accelerated cheese ripening and production of enzyme-modified cheeses (Stepaniak, 2004). But it is the rennet coagulation that develops the basic structure of cheese, and there are hundreds of cheese varieties ranging from very soft cheeses, such as Camembert to the hard ones, such as Italian Grana cheeses. The rennet enzyme coagulates the casein micelles in milk by reducing repulsion between casein particles. Rennet-altered micelles aggregate into clusters and chains that eventually form a network that surrounds the fat globules. Formation of the rennet gels can be monitored and controlled by the cheese-maker (Stepaniak, 2004; Lucey, 2007). For what may be a traditional farming industry, there have been many major biotechnological developments in recent years, but then it is a big industry, and it grew rapidly across the start of the 21st century, though it has faltered more recently as an increase in value of the US dollar together with a sharp decline in the price of milk reduced both cheese market prices and industry revenue figures in dollar terms. Using 2017 statistics, the European Union produced 9.9 million metric tons and the USA 5.6 million (source: https://www.statista.com/), and global revenue was $99 billion, although the global cheese manufacturing industry suffered an annual 3% decline in the period 2012-2017 (source: www.ibisworld.com/). Cheese ripening depends on a host of metabolic processes and involves a complex of interrelated events. The biochemical pathways through which lactose, lactate, milk fat and caseins are converted to flavour compounds are now known in general terms. More than 300 different volatile and nonvolatile compounds have been implicated in cheese flavours. These flavour compounds originate from biochemical pathways like proteolysis, lipolysis, glycolysis, citrate and lactate metabolism; the relative contribution of these processes depends on the variety of cheese and its characteristic microbial flora (McSweeney, 2004; Stepaniak, 2004). Indeed, the variety of flavours come from a succession of microbes (bacteria, yeasts and fungi) that determine the consistency and flavour of the cheese. Surveys based on 133 isolates provided by producers of cheese and cheese starter cultures, together with 97 isolates from culture collections showed that cheese fungi are found in two classes, the Eurotiomycetes with Penicillium species (Eurotiales) and Sporendonema casei/Sphaerosporium equinum (Onygenales), and the Sordariomycetes with Scopulariopsis species (Microascales) and Fusarium domesticum (Hypocreales). Some of these fungi, such as, Penicillium camembertii, Fusarium domesticum, Scopulariopsis flava and Scopulariopsis casei, are only known from cheeses and are probably adapted to this specific habitat, which is extremely rich in protein and fat. Other cheese fungi are ubiquitous, such as, Penicillium roqueforti, Scopulariopsis candida and Scopulariopsis fusca (Ropars et al., 2012). By comparing the genomes of ten Penicillium species, Ropars et al. (2015) showed that adaptation to the cheese habitat was associated with several recent horizontal transfers of large genomic regions carrying crucial metabolic genes (see Section 17.15 and Section 18.8). Seven horizontally transferred regions, of more than 10 kb each, were identified flanked by specific transposable elements, and displaying nearly 100% identity between distant Penicillium species. Two of these regions carried genes with functions involved in the utilisation of cheese nutrients or competition, which were associated with faster growth and greater competitiveness on cheese and contained genes highly expressed in the early stage of cheese maturation. These regions were found to be nearly identical in many strains and species of cheese-associated Penicillium fungi, indicating that recent ‘selective sweeps’ had increased their frequency in the population by natural selection (Ropars et al., 2015). Mould ripening is a traditional method of finishing cheeses which has been in use for at least two thousand years. 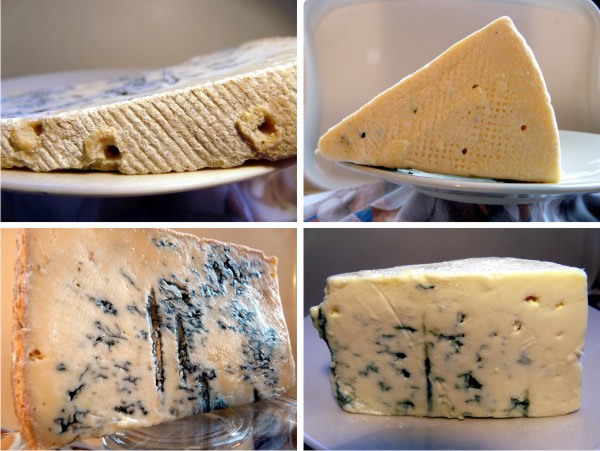 Blue cheeses, like Roquefort, Gorgonzola, Stilton, Danish Blue, and Blue Cheshire, all use Penicillium roqueforti which is inoculated into the cheese prior to storage at controlled temperature and humidity by having its spores forced into the new cheese on the tines of a metal comb. In some procedures the Penicillium roqueforti spores are mixed with the curds during the final whey-removal process and the function of the metal tines is then to introduce air channels through the cheese to encourage the (aerobic) fungus to grow. The inocula come from starter cultures of proprietary strains of Penicillium roqueforti, P. camembertii (for cheeses) and P. nalgiovense (for salami) produced predominantly by solid-state fermentation because this process gives better yields of homogeneous and pure spores. After inoculation the fungus grows throughout the cheese and into the voids between curd particles, producing flavour and odour compounds. The holes and tracks made by the inoculation/aeration device are usually evident at point of sale (Fig. 41). Fig. 41. Samples of blue cheeses (gorgonzola on the left, Danish blue on the right) bought from a Stockport supermarket which show (top) holes in the outer ‘rind’ made by the tines of the inoculating/aeration device when the Penicillium roqueforti spores were injected into the newly pressed cheese, and (bottom) spore production within the cheese revealing the tracks made by the tines during inoculation and revealing growth of the fungus into the voids between curd particles. Photographs by David Moore. Camembert and Brie are ripened by a mould called Penicillium camembertii, which changes the texture of the cheese more than its flavour. This fungus grows on the surface of the cheese extruding enzymes which digest the curds to a softer consistency from the outside towards the centre (Fig. 42). Fig. 42. A mature Camembert cheese ready for eating (top). 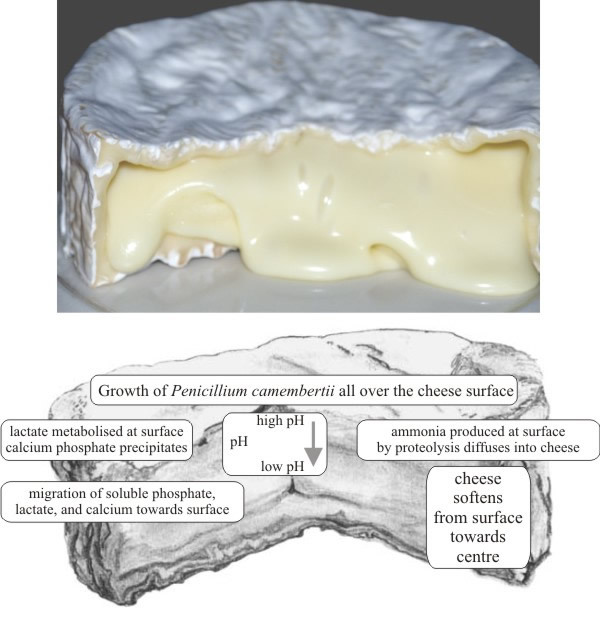 The sketch below is a schematic representation of the changes that occur during ripening of such a cheese as a consequence of the growth of Penicillium camembertii over the surface of the cheese. Photograph by David Moore, schematic modified and redrawn from McSweeney, 2004. Mushrooms are a useful, and acceptable, addition (‘meat extender’) to meat content in beef sausage recipes (Al-Dalain, 2018), but Penicillium nalgiovense is a filamentous fungus (Ascomycota) which is the most widely used as a starter culture for cured and fermented meat products. Use of moulds in the production of fermented sausages is known from 18th century Italy where fermented and air-dried sausage was a popular peasant food because it could be stored safely at room temperature for long periods. Today salami is widely produced in southern-European countries using a range of meats, including beef, goat, horse, lamb, pork, poultry, and/or venison. The chopped meat is mixed with minced animal fat, cereals, herbs and spices, and salt and allowed to ferment for a day. This mixture gives the salami sausage its typical marbled appearance when cut. The mixture is then stuffed into a casing, treated by dipping or spraying with a suspension of the P. nalgiovense starter culture at a concentration of about 106 spores ml-1, and finally hung to cure. the surface covering of the mould mycelium controls the drying process and ensures a smooth and uniform surface appearance of the product.